These are testimonies and personal stories, collected by the media team of the European meeting. Yesterday, 950 volunteers came to Valencia two days in advance to help. The most numerous are those from Ukraine, from Poland and from Spain. They were welcomed in the Colegio de las Esclavas and then sent to their host parishes. The first meals and prayers took place with all the volunteers and brothers in Jardín del Turia. As a member of the Evangelical Presbyterian Church of Togo, I have come to this meeting in Valencia in order to experience such a gathering of young Christians from various backgrounds, so that I can better prepare the pilgrimage of trust on earth which Taizé will organize in Cotonou (Benin) in 2016. 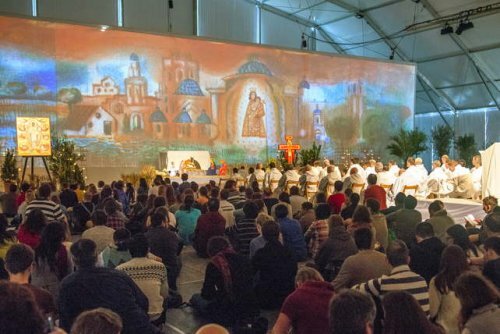 I went to Taizé on 20 December, then I travelled to Valencia where I have been hosted at Joseph and Julie’s, along with two Belgians. Our hosts took us this morning to the welcome place at the Colegio de las Esclavas, then they took us for a tour of the main sights in Valencia city center: the Basilica, the Cathedral, the Central Market, the Faculty of Theology, the Plaza de la Reina. Nazar and Andriy, two 16 year old Orthodox Christians from Khmelnytsk, in Ukraine, arrived with a small group of six people. 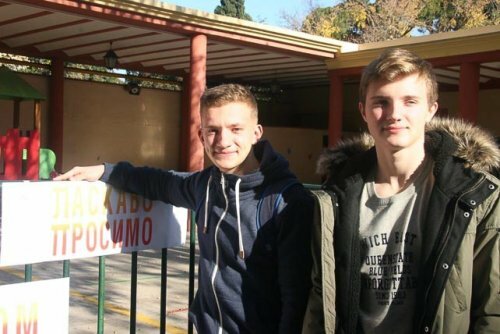 The boys arrived in Valencia in the early morning, ready to be volunteers and to work, even though this was their first international meeting. They were enthusiastic about the idea of meeting people with new horizons and being able to share their experience of faith. Ingrida and Janutis, two young Lithuanians aged 21, came with a group of nine people. Coming to Valencia from Lithuania had been a very long journey. 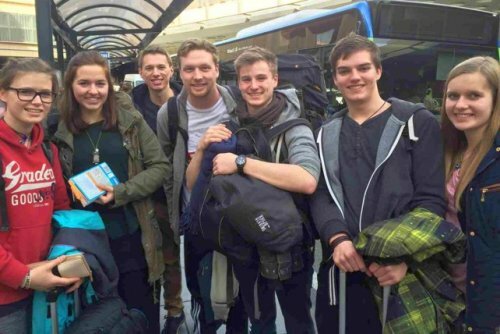 In order to be able to help as volunteers during the meeting, the group had left on 22 December, crossing Poland and Germany. They spent Christmas Eve in Lyon in France, sharing their meal in the bus, which had become their home for the duration of the journey. On the 25th, they arrived in Barcelona where they were able to attend the Christmas Mass in the cathedral. They finally reached Valencia with a lot of stories to tell! Today is the big welcome day. In seven places around Valencia the pilgrims have joined the 950 who arrived on Saturday. They have been welcomed in their own languages and given a full explanation about the meeting, along with a transportation card and an itinerary, which will also serve as a meal ticket. After this, they were sent to their parishes to be welcomed there and introduced to their host families where they will stay during the meeting. My journey started in the village of Taizé. I went to spend Christmas there, without any plans for going to Valencia. But in Taizé I met Erica who became a friend. She was in the same position as me, so we decided to team up. After some research, we found out that a bus was going from Lyon to Valencia. So everything was arranged on the 23rd, two days before leaving for Valencia. On Christmas morning we left Taizé, after a beautiful prayer in the village church. 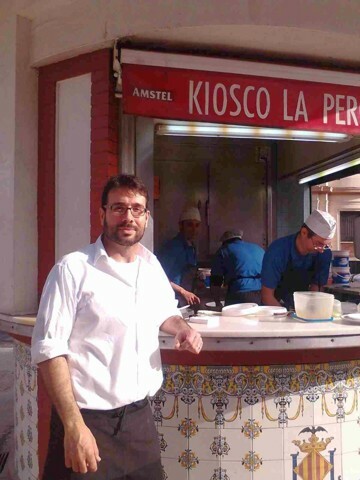 Carlos is from Valencia and works in a small restaurant in the middle of a main street, close to Colegio de las Esclavas. 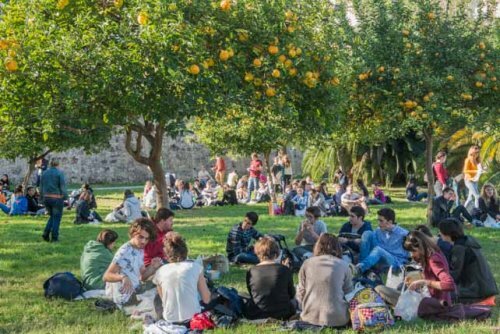 As he was only informed by teachers from the school, he didn´t know a lot about the meeting in Valencia, but he noticed the growing crowds passing by and likes having so many young people from different cultures around. Although Carlos doesn’t describe himself as a very religious person he is positive about the meeting: “It’s always good when people have faith! And when they meet for something good”. He only seemed a bit disappointed that he wasn’t better informed beforehand. He is now thinking about going to the evening prayers and taking part in one of the workshops over the next few days. Studying in Spain as an exchange student since September, she travelled only four hours to get to Valencia and is very excited about the meeting. Her host family was very welcoming. They have seven children and made space for four guests - three from Poland and one from Ukraine. Agnieszka couldn’t spend Christmas at home, so for her it felt like a “warm bath” to be welcomed by such a big family and also a bit like home. Our journey began on Sunday at Hamburg airport. After a three-hour flight, the sun welcomed us to Madrid. Then, the fastest train we’ve ever seen brought us to our final destination, the beautiful city of Valencia. On our way, we took a lot of detours in the historical city centre, passing small shops and restaurants filled with laughing people. As they saw that we were lost, many residents offered to help us find our way. Luckily we met a brother, who invited us to the evening prayer at Turia Park - a wonderful, spiritual end to an exhausting, but exciting day! The activities in the host parishes — common prayers, visits and small sharing groups allowed participants get to know each other and to meet witnesses of hope. In the afternoon there was a wide programme of workshops. During the evening prayer, Brother Alois announced the next steps in the pilgrimage of trust on earth and the next European meeting in Riga, Latvia. The theme of “mercy” was discussed in the interreligious workshop. 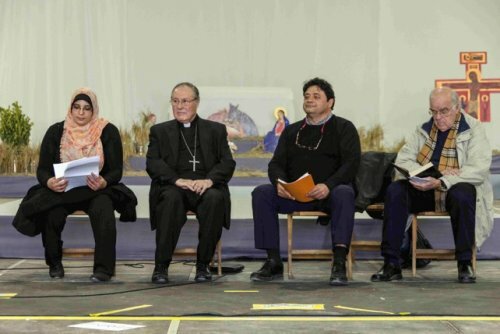 Isaac Sananes Haserfaty, the president of the Jewish community of Valencia, Don Esteni Escuerdo, the assistant bishop of Valencia, and Miriam Barouni, the youth representative of the Valencia Cultural Centre each shared their perspectives on mercy. The three agreed that every living creature is the object of God’s love and mercy. Mr Haserfaty explained the Jewish feasts where you ask others for forgiveness in order to receive God’s mercy. The Bishop focused on Biblical stories such as “the prodigal son”: “God is more than justice. He is love; He opens his arms and forgives us”. The workshop included questions from young people. The main issue underlined by the questions was why there is so much war when the three religions agree on the meaning of mercy. Miriam Barouni responded by saying : “I belong to a religion that is accused of being violent and terroristic, but the people who do those criminal acts do not represent me as a Muslim. My God and his prophets teach me to live in love, peace and respect for others. So the real Jihad is the fight against the ego, the selfishness of human beings”. 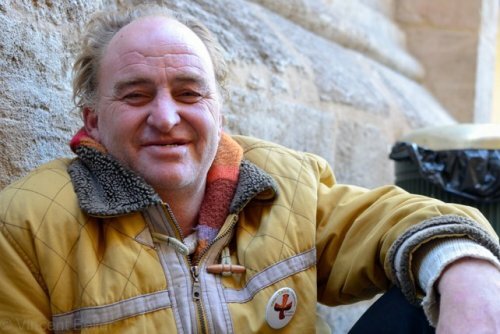 “I was lying on the ground in a street in Valencia, like every day of the last three years, when a man came to me and invited me to pray with him in the nearby church; we went in together. It had been such a long time since I last prayed. After a morning in the host parishes as on the preceding days, there were meetings by country, as during each stage of the pilgrimage of trust. In the evening, participants gathered in churches across the city and region for a prayer of peace at 11pm, then a festival of nations during which each national group in the parish could present a dance, a song, or a cultural tradition. During the meeting for those living in Japan, another one asked to the brother if it would be possible for non-believers to approach toward the truth—she said the “principle” of life. She also asked what the mercy really means in the daily sense. All these questions resonated in me deeply, I think they really helped us to think about what it really means to have faith. In our host parish, I ended up becoming an animator. I think we all had a very good time of sharing in the small groups. 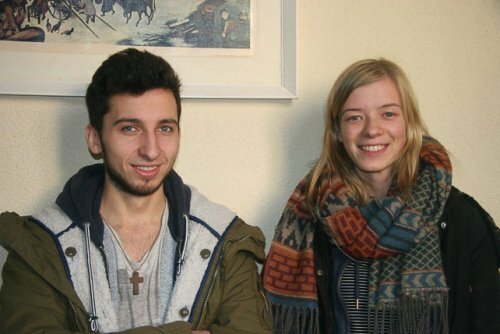 An Austrian student chaplain, Aloys, from Graz (Austria) shared his experiences during a visit to Syria two years ago, in the light of Brother Alois’ recent visit. At the time of his visit, Homs was a more peaceful city. He remembers how Muslims, Jews, and Christians prayed together in the old mosque. Today, there are many refugees from Syria in Austria. Many people show solidarity and try to support those who are in need, despite the unfamiliarity and fear which keeps some people from engaging with these refugees. This winter, Aloys organised a Christmas dinner for Syrians in Graz together with a community of students. 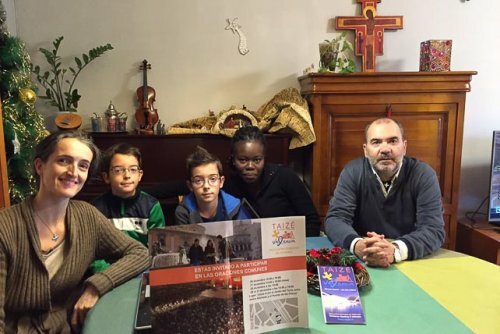 He often organises trips to Taize for these students and has also accompanied groups to the annual European Meetings. He says ecumenical prayer is very important and it is essential to the future of our church - he hopes that one day he will be able to host Taizé pilgrims in Graz. For the other brother this way of thinking seemed too big. “If we focus too much on the big things, we may miss small signs that God is sending us”, he said. Both brothers agree that everyone must start “small” in life, but things can grow bigger and bigger until they reach a surprising size. For this to happen, it seems to be necessary to learn how to hear God’s voice. The best example is Jesus, who built his whole life on one little sentence, ’You are my beloved son’. Apart from God’s Word it is also important to listen to the words in our heart, because they are a deeper, unexpressed desire that we bear within us. Raul is aware of how much responsibility he has and the amount of work he has to do, but he is happy that the Brothers have put so much trust in him. After the Eucharist in the host parishes, the families welcomed their guests for the New Year meal. Then the young people went to the departure point of their buses, or the station or airport, to return to their own countries. 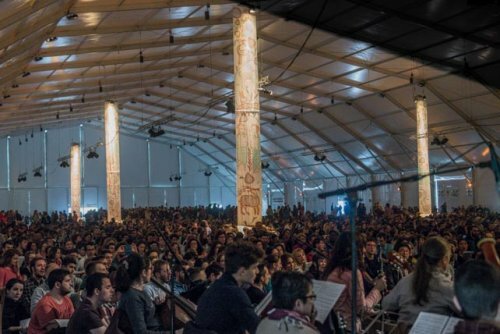 52 countries were represented by the participants, without counting the volunteers who had come from Taizé! We were welcomed by an elderly lady, in a village to the West of Valencia. At first we didn’t talk a lot because of the language but the elderly lady conveyed her affection in offering us a copious breakfast and sweets for the day, and in frequently repeating to us “you are at home here”. As the days went by we dared to talk a little more in Spanish and on New Year’s Day her daughter came to eat with us and the conversation was easier. As we were leaving, the elderly lady gave us a duplicate set of the keys for her house. We didn’t understand at first, explaining that we were going home to France, and she added “I told you that you were at home here, so keep the key and come back when you want…” We found this trust deeply moving and it made us think. One of the best moments I experienced these days was saying the Our Father in more than ten different languages. We were gathered in the One who unites us, independently of our denomination, language or origins. In one of his meditations, brother Alois told us: “Each of our lives can become like a small light of peace that shines in the darkness”. It is clear that for this we still have work to do. We must participate in the construction of a new world, that is committed and in solidarity, united and pluralist. I carry in my heart the many people I met, from Spain and from many other countries. On January 1st, we shared the New Year’s Day meal with our host families, after the Mass. In the parish where I was welcomed, one could hear friendly conversations in various languages - Polish, Croatian, Italian, Spanish… Then we were able to experience once again the feeling of hospitality from Spanish families, whilst sharing a traditional paella. With all my heart, thank you to all our hosts for their kindness! I know some stories of refugees, because i am working as a translator for them. 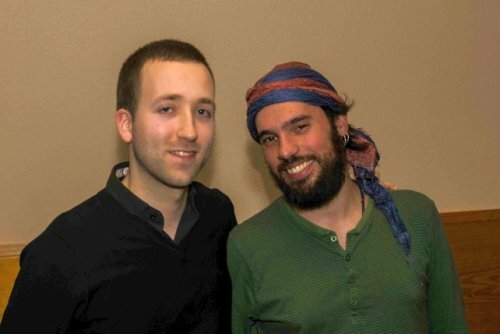 In Valencia, the words from Brother Alois and his visit in Syria touched me in a special way. Indeed, I have seen pictures of the bombed and destroyed Syria, which a refugee showed to me. Brother Alois’ words gave me back the stength not to give up being merciful and forgiving people. Some people are now saying that all refugees—and foreigners—who are located in Germany are criminal. But this is not true, and since Valencia I try to speak to people and take away their fear.